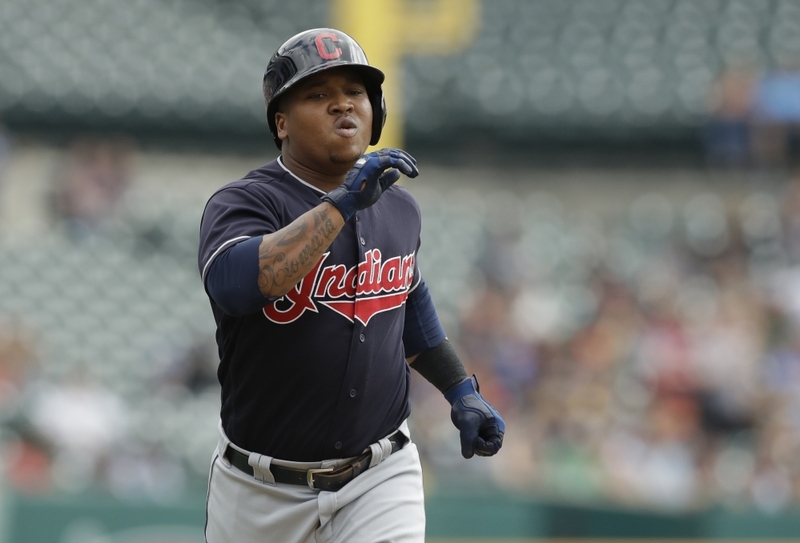 Jose Ramirez homers twice as Cleveland beats Detroit. 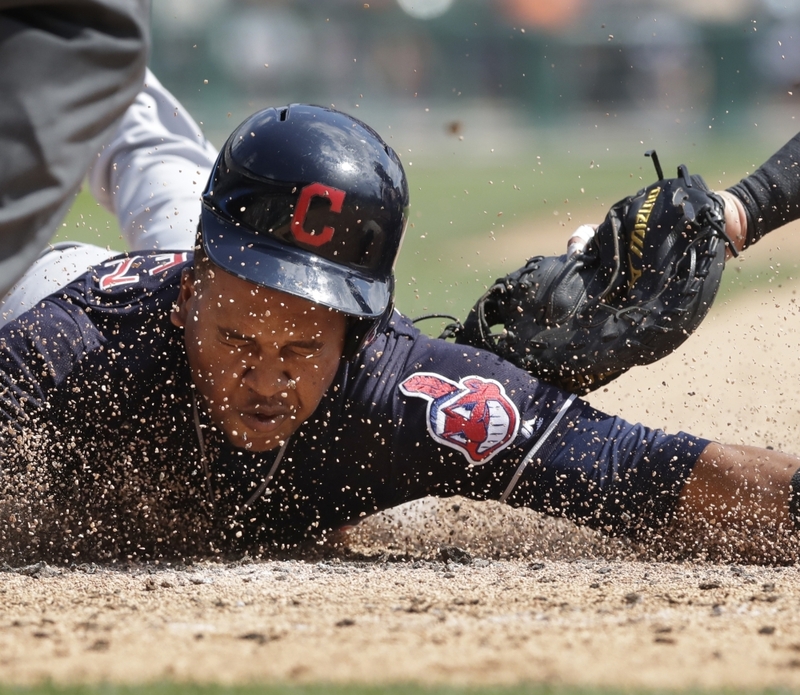 DETROIT — Jose Ramirez tied a major league record with five extra-base hits, including a pair of home runs that deflected off Detroit outfielders, and the Cleveland Indians routed the Tigers 11-1 Sunday for their 11th straight victory. Ramirez had three doubles in becoming the 13th player with five extra-base hits in a game. Kris Bryant of the Cubs did it last year, and the previous Cleveland player to accomplish the feat was Kelly Shoppach in 2008. The AL Central-leading Indians have their longest winning streak since a team-record 14-game run last year. Ramirez went 5 for 5, driving in three runs and scoring three. Ramirez hit a strange solo homer in the first. The ball hit the yellow padding on top of the left-field fence, caromed straight in the air and bounced off the padding and back into play. As left fielder Mikie Mahtook tried to grab it with his bare hand, he knocked over the fence. In the sixth, right fielder Alex Presley reached above the fence for Ramirez’s drive and ball bounced out of his glove and over the wall. ORIOLES 5, BLUE JAYS 4: Welington Castillo hit two home runs, including a game-tying shot in the ninth inning, and Mark Trumbo won it in the 12th with an RBI single as host Baltimore beat Toronto. WHITE SOX 6, RAYS 2: Rookie Lucas Giolito struck out 10 in seven sharp innings, Jose Abreu homered in his return to the lineup and Chicago won at home. ROYALS 5, TWINS 4: Lorenzo Cain hit a go-ahead, two-run triple in the seventh inning after a checked-swing call went his way on a close two-strike pitch, leading Kansas City to a win in Minneapolis. RANGERS 7, ANGELS 6: Elvis Andrus hit two of the four Texas home runs and the Rangers held on to win in Arlington, Texas. MARINERS 10, ATHLETICS 2: Robinson Cano homered and drove in four runs, Andrew Albers took a no-hitter into the sixth inning, and Seattle swept Oakland at home. DIAMONDBACKS 5, ROCKIES 1: Ketel Marte and Brandon Drury homered in a three-run sixth to bolster a strong outing by Zack Godley and Arizona extended its winning streak to 10 games by beating Colorado in Denver. PHILLIES 3, MARLINS 1: Nick Williams hit a two-run single with two out in the 12th inning, and five Philadelphia pitchers held host Miami to four hits. PIRATES 3, REDS 1: Trevor Williams pitched seven scoreless innings, Jordy Mercer homered and Pittsburgh won at home. BREWERS 7, NATIONALS 2: Domingo Santana homered twice, and host Milwaukee beat Washington to take three of four games from the Nationals. BRAVES 5, CUBS 1: Max Fried combined with four relievers on a five-hitter in his first major league start, and Atlanta ended host Chicago’s six-game winning streak. CARDINALS 7, GIANTS 3: Harrison Bader hit a tiebreaking homer leading off the sixth and St. Louis won in San Francisco. PADRES 6, DODGERS 4: Erick Aybar hit a go-ahead, two-run homer as San Diego gave Los Angeles its eighth loss in nine games, in San Diego. ASTROS 8, METS 6: Cameron Maybin hit a three-run homer, George Springer also homered and Houston beat New York for a sweep of their weekend series in Houston.